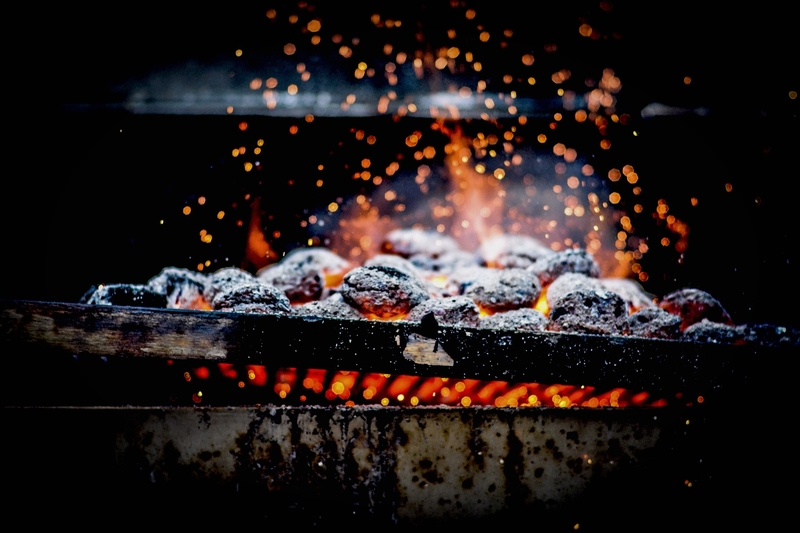 Netflix’s Salt Fat Acid Heat, a 2018 docuseries adaptation of the James Beard Award-winning book of the same name, is ripe with color (those on the spectrum and those that are not—like the neon electricity of flames on camera), sound (wood crackling, leaves brushing, waves breaking, old songs like “Primavera” in a honeyed Italian voice), and visual flavor (the food, just all the food). 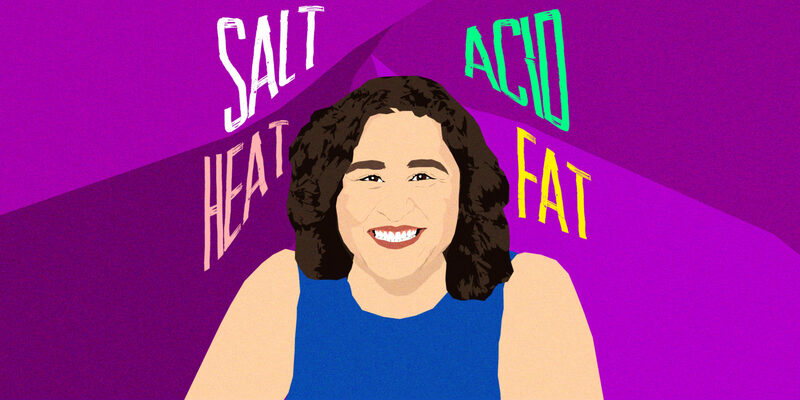 The series, which debuted on October 11th, has resonated especially because of its wandering chef and protagonist, Samin Nosrat, who offers a fresh contrast to the often male-led travelogue series model. Prominent male protagonists, like Zimmern and Bourdain, helped shape the familiar form of the narrative food travel show, but Nosrat has disrupted the format with a woman-forward series highlighting many female artisans, grandmas, and women like or unlike herself who work in food. In college, Nosrat first discovered Chez Panisse, the iconic Berkeley eatery that fused the ethos of California and French cooking, and hasn’t looked back. 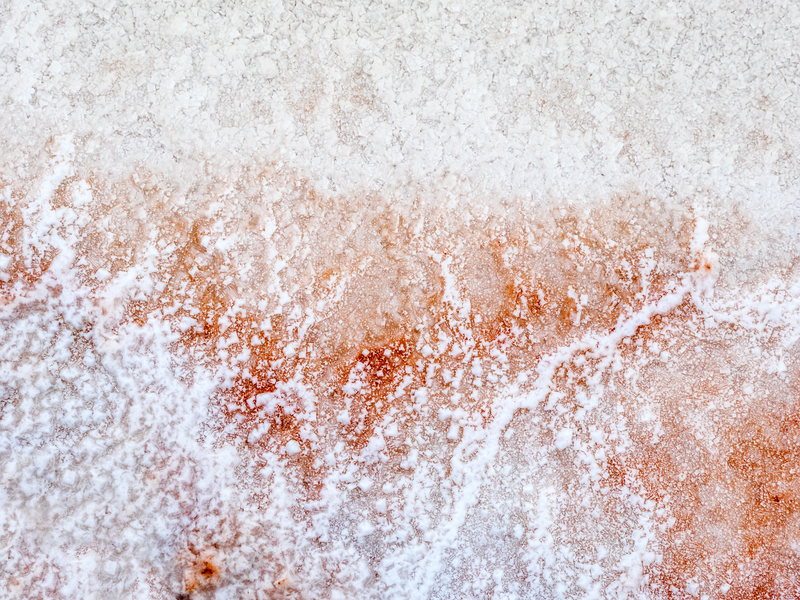 Her passion for food and flavor comes across in small details: her bubbling laughter in the kitchen, her need to touch to understand, the full-mouthed sounds of gratitude she makes biting into a salsa-streaked taco. The show is, quite simply, a joy to watch, its sounds both ambient and melodic, its forays into Italy, Mexico, Japan, and California both familiar and mysterious. During our phone conversation—which had a less-than-auspicious start when I accidentally hung up on her, not recognizing the voice I had come to know so well from my television screen masked by a sore throat—Nosrat explained to me that understanding her Iranian-American identity came inextricably tied to understanding intersectionality and building strong friendships with women of color. We also discussed the best rice textures (crispy and creamy are good, but have you had both at the same time?) and the “gentle” ways she inserted and asserted feminism in her series. Nicole Adlman (NA): On The Blend, we cater to the multicultural experience. We speak to women of color, people who feel marginalized, people who feel like they’ve been tethered to otherness their entire lives. Samin Nosrat (SN): My people. NA: Can you tell me about some enduring food or flavor memories you have from growing up in an Iranian household. SA: The primary memories of my childhood are definitely around food. I was actually just looking through some childhood photos and they all center around food, which is kind of amazing. There was a lot of eating in my childhood because it was the primary way my mom shared our culture with us. She spent a lot of her time cooking and shopping and I remember that really clearly, things like taking trips across Southern California to the Hindi food grocery to find the most flavorful herbs and vegetables. And for her and for everyone in our family the highest compliment an ingredient or a dish could get is that it tasted like Iran. For me, being born in San Diego, I didn’t understand what that meant, you know? I just understood it as this great compliment. Many years later, when I was in my twenties and living in Northern California, getting to know all of these local farmers and this amazing produce, I brought some of the most delicious citrus fruits that I ever had from one of Chez Panisse’s farms back to my grandmother and my mom, and they said this tastes like Iran. And I thought mission accomplished. I finally also understood that for them what it meant was the taste of pesticide-free agriculture, naturally grown things. What they had grown up on was very nourishing food from the land but for us, here in the States, after a century of processed foods, natural was now suddenly this rarefied thing. So it was an interesting glimpse into my family’s past and also into the past of American agriculture and hopefully its future, too. But let me think of specifics. I had a series of favorite foods—kind of like I had an ongoing poll. My mom always kept track of our favorite dishes because I have two brothers and in the spirit of fairness she would rotate dinners between us. One dish I loved is adas polo, Persian lentil rice, and I think the reason I really liked it were the raisins on top, providing a bit of sweetness as you eat it with chicken. And every rice dish she made always had tahdig, the crispy rice. Later on, I loved a dish called tahchin, another rice dish. The way it’s baked gives it a sort of pudding consistency: you take chicken or lamb, and marinate it overnight with yogurt and lemon and saffron, and you scrape all the yogurt off before cooking the meat in broth. Then you layer the cooked meat into the rice, mix all of that yogurt marinade into the rice so the rice becomes pudding-like, almost a custard consistency. It’s like a Persian version of biryani. And so you get the beautiful saffron crispy rice on the bottom but because there’s yogurt it kind of caramelizes and burns more deeply brown. I love that brown taste. You find these little treasure pockets of chicken as you eat. That’s a traditional celebration dish because there’s so much saffron in it, but apparently I had extravagant taste because that was my favorite as a child. NA: So were you often in the kitchen with your mom cooking? SN: I wasn’t. I remember she taught me to make tuna salad because she wanted me to be able to make my own lunch for school. But my brothers and I did a lot of baking because my mom didn’t bake. She also didn’t indulge us with sweets, so if we wanted them, we had to bake them ourselves. I remember getting a few baking books and making cheesecakes and choux pastry and cookies but there was never a big internal drive—I wasn’t really drawn to the kitchen and my mom didn’t really encourage us to be. She wanted us to do our homework. Going shopping is the larger part of my food memories with her, and I continue to be a person who considers shopping the first part of cooking and I take a lot of pleasure in that. And anytime there was a very labor intensive thing like cleaning fava beans, which is a two-step peeling process, she would make me and my brothers do that. But I wasn’t really drawn to cooking and, ultimately, I think that’s reflected in the fact that I didn’t go to Chez Panisse to be a cook. I just went there because it felt like a magical place and then I fell in love with the cooking. Even once I did, I still didn’t know that I wanted to be a cook. It was never really my life dream to be a chef of a restaurant. NA: Did you speak Farsi at home with your family? SN: My brothers and I went to school on Saturdays to learn how to read and write in Farsi. But I read and write probably like a second grader. These days mostly my mom speaks to me in Farsi and I respond in English. But when I’m in Iran, within a couple weeks I’m fluent again. NA: I noticed an interesting dynamic between you and your mom on the show. In one scene, you both tasted rice and agreed that it could use more salt (it must not have been as salty as the sea), and you joked aloud that it was the first time you ever agreed about something. So I wonder, do you often disagree about flavors and food readiness in the kitchen? SN: To be honest, we don’t spend a lot of time together in the kitchen. That was a rare instance—because when it comes to Iranian food I don’t think she’s that interested in my opinions. It gives her a lot of pleasure to cook for her kids, so she wants to make things for us, and I want to eat the food of my childhood, so I can maybe remember two times that I’ve ever actually cooked for her. Our dynamic is she’s the boss and I defer to her. NA: What are the first things you want to eat at home? What tastes like Iran to you? SN: Iranian cooking, like most traditional cuisines, is very seasonal, so there are the different stews and dishes that are appropriate during different times of year. Most of the time my cravings depend on what time of the year I’m going home. There’s a dish called sabzi polo, which is rice with herbs, a green rice and traditional springtime dish. I love the taste of the cooked herbs in the rice. I could ask for sabzi polo any time and I would probably be obliged. There’s another one called baghali polo, which is very specifically a springtime dish, dill rice with fava beans in it. And that one’s a traditional March-April dish, usually served with lamb shanks, which I love. I will always ask for it. But a lot of the time I’ll just ask for the simple, childhood favorites like adas polo, the lentil rice and the tahjin. There are a lot of stews, which are called khoresh, and probably my favorite khoresh is eggplant with sour limes and tomato. That’s a classic summer dish that I really like. But really, to me, as long as there’s tahdig and yogurt I’m happy. NA: I’m curious about a memory you reference both in the show and in your book. I don’t know if it was your first Thanksgiving ever but it was your first white Thanksgiving, maybe, and you describe slathering your food in cranberry sauce to get some much-needed acidity. SN: It was my first. No, we never had Thanksgiving at home so it was my first ever. And definitely white. NA: Was it strange to you or your hosts when you needed all that acid, that cranberry sauce atop everything, to cut through the heaviness of the food? SN: I don’t know that I was so articulate in my thoughts at the time. I remember it was my college roommate who was so lovely and generous, and her family seemed pretty classic, like if you imagine a picturesque American family, that’s what the house was, what the family was, what the food was. And by then I had started cooking a little at the restaurant so I was really into helping out in the kitchen but also very much a guest in someone’s home—I just did whatever they told me to do, you know? And they were avid home cooks so I was following whatever Martha Stewart recipes or whatever they were following. I was excited to participate in this tradition that I’d always heard about but never experienced. But I do remember coming to the table and…I don’t think even in the moment I understood why it was such a letdown. I remember that and many subsequent Thanksgivings where I feel like I’ve just eaten a gut bomb. It’s a very heavy plate of food and it doesn’t feel particularly balanced in any way. Looking back, I know that I reached for the cranberry sauce many times; it’s a pretty natural thing that we all want that acid. Everyone’s just slathering cranberry sauce onto the plate because often it’s the only acid source. So it was only in retrospect that I understood what was missing, when I was looking back from a cook’s point of view. I don’t think they noticed that I was out of sorts. I don’t even think that I was really out of sorts. I don’t think I understood what was missing but when I thought about it later and asked myself why that meal was so unbalanced, or why are thanksgiving foods just so—not difficult to eat because after all that cooking you’re excited to sit down and eat and make a plate—it’s just that I don’t relish it in the same way that I do when I have Mexican food that has nine different salsas and sour cream and guacamole and all of those acidic sauces on it. And finally I understood that I was able to introduce that acidity to Thanksgivings, at Thanksgiving tables where I was sitting. NA: Is there an analogous food-centric Iranian holiday? SN: Persian New Year is made up of multiple mini-holidays over a two-week period. It begins on the last Tuesday night of the year, which, because the year begins on the first day of spring, is usually the third Tuesday in March. We gather outside to jump over bonfires and cleanse our spirits for the upcoming year, and eat a soup called ash reshteh, made with a bunch of cooked herbs and greens. 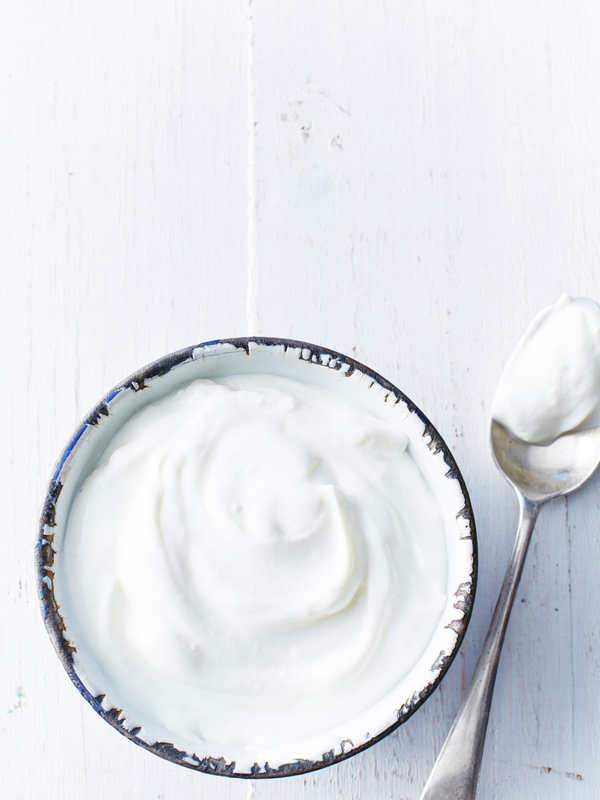 It has noodles in it, and kidney beans, sometimes little meatballs and always a dollop of yogurt or whey, creamy whey from yogurt. And often that soup is made with sour limes. It’s almost naturally balanced and then you put this dollop in because it’s always missing something until the dollop of whey gets in there. For the first meal of the New Year everyone gathers at the table and the traditional dish is that sabzi polo, the herbed rice, with fish, which usually my mom would make two kinds of fish. She would make either trout or salmon and then smoked fish that she would fry up so that it was bacony tasting, which was so good. And there was always the tahdig, of course, and that always comes to the table with like 9,000 other sour things. Always yogurt and then often for fish, any time there’s fried fish, we squeeze sour oranges over it, the same ones from the Mexico episode. My mom always made the most regular, everyday salad in Persian cooking, shirazi salad, which is our version of the Israeli salad—tomatoes, onions and cucumbers with a ton of lime juice over it. It’s Persian pico de gallo. 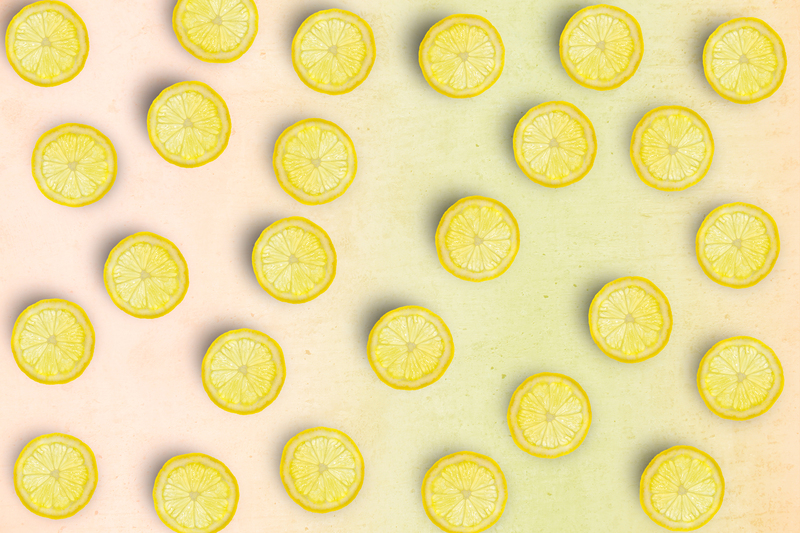 There’s no shortage of sour things. And traditionally on the last day of the New Year, on the thirteenth day of the New Year, we gather outdoors for a big picnic. That’s when we eat the baghali polo, always with yogurt, and often there’s many other dishes, like a classic picnic dish called salad olivieh, which is like the Iranian version of chicken salad, a chicken and egg mayonnaise-y salad with pickles in it. Just a classic picnic food. In Iran people just picnic anywhere, on the side of the road or by a river, but I grew up in San Diego so we’d always go to the beach—both for the fire jumping holiday, where tons of Iranians would gather and jump over bonfires, and then also on the April 2nd holiday when it was just so many families of Iranians at the park together. NA: Do you still go home every year and celebrate? SN: I think as I’ve gotten swallowed into my work life I haven’t. I do it in smaller ways but I haven’t been to the big celebration in a long time. NA: Did you ever have moments growing up when you felt unsure about your identity—about being Iranian and maybe having to grow into your culture? SN: It’s been my whole life. There are things about my family that I still don’t know; there’s a lot of secrecy in my family surrounding our immigration and our family history. I’ve had to piece together a lot in retrospect, and I think my mom, when she came here with my dad, always thought we’d go back. In many ways, the way that she raised me and my brothers seemed like she was planning to go back. She really wanted to immerse us in our Persianness, and she did. I don’t think many Iranians’ arrival here was so welcoming, so for my mom, she’s not had the warmest feeling toward her adopted homeland. NA: She was probably also mourning Iran. SN: My mom insisted to us that when we were home we were in Iran and we were to act like children do in Iran, which is to speak Farsi, to be respectful of our elders, to follow the rules. But outside, out there, that was America. When she called us American, which I think in some ways she meant more to call us white, it was kind of an insult. Like if we did something bad, she’d say, “You’re being so American right now,” and so on. And then when I went to school I very much was like, okay, well I’m not like the other kids because I’m Iranian. I had internalized what my mom taught me and decided I wasn’t inherently like the other kids. I didn’t look like them, my name was different, people mispronounced my name, I had different foods in my lunch. So even though my mom positioned America as “out there,” like, when you go “out there” you’re American, I didn’t feel that American because I didn’t feel like other kids. But when I came home it’s not like I forgot about the world I had been in all day, so I didn’t feel fully Iranian either. When I was 14, I went to Iran and I was very obviously not like my cousins. I didn’t grow up there, I didn’t speak Farsi like they did. My brothers and I were definitely not Iranian either. So now that I wasn’t American and I wasn’t Iranian, I didn’t know what I was. And I’ve always felt a little bit lost—I still feel kind of lost. At the same time, I’ve happily adapted and I’m really proud of who I am. As I’ve gone out into the world and made many more diverse friends and many more immigrant friends, just like multiracial friends and biracial friends, I understand my experience was not all unique. But I certainly felt alone when it was happening. NA: So in terms of growing into that hyphenated identity and coping with feeling different, it happened as you got older, as you traveled the world, as you built communities of friendships outside of where you grew up? SN: Absolutely. I would say making a more diverse friend group has been a part of it but it’s taken a long time to come to this place, like a really, really long time. When I was young I thought that because I didn’t fit in anywhere, the only way I could prove myself to anyone was by being excellent. So I was like, okay, I’m going to be the best student ever, I’m going to be the best whatever ever. I just made it my career, my job, my life goal, my everything, to be excellent and to be an achievement machine because if I was the best at whatever I did then people had to accept me and couldn’t make me feel as if I didn’t belong. I often infiltrated the most elite institutions I could find or make my way into and then tried my best to succeed there, whether it was my university or Chez Panisse, because that’s how I understood the world. Over the last 10 years, I have been going to therapy, which has been helpful in understanding that I am not my achievements, I am not defined by my achievements. And in the last three or four years, as I’ve learned a lot about black feminist history, I’ve become a student of intersectionality and learned about the ways I had participated in oppressing myself or oppressing other people. Just not really letting myself be a whole human. I had surrounded myself with white people, and many of them are really wonderful people in my life, and I love them dearly, but there came a moment when I finally understood that I couldn’t ignore this: my whole life I had essentially been trying to masquerade as a white person. And I didn’t want to be in costume any more and part of that meant inviting more people of color, people from marginalized communities, into my life, surrounding myself with people who I can let my guard down around, people who I know by virtue of their own life circumstances have a shared experience with me. NA: Do you feel good—more whole human—today? SN: Yes, except for my voice. NA: What are certain dishes that make you feel strong emotions when you make them? SN: Any type of handmade pasta. Like for me pasta is a really beautiful thing. I spent almost 10 years of my cooking career making it every day. I feel like I really understand pasta in a way that I don’t necessarily understand other things that I cook. NA: It seems like you’ve adopted Italy as a second home—I sensed that watching the show. There was a homecoming episode in the Bay Area, of course, but really the first episode when you were in Italy seemed like a homecoming for you. SN: It absolutely was. I mean, it was my first time there in 13 years. I couldn’t believe how much Italian I remembered. I couldn’t believe how at home I felt. And it really is a place. I had always had some sort of inexplicable draw to Italy and there are a lot of similarities between Italians and Iranians. We’re both hot-blooded cultures. We yell a lot. We care a lot about food, we’re very family-oriented. So in a lot of ways I did feel very at home there. And there’s just something about making pasta and the way I use my hands, because it’s so much more about feel than it is about recipe. I really take pleasure in making things like tortellini and ravioli and anything where it’s a lot of intentional handwork—picking up each individual piece. If I’m eating a bowl of tortellini and there’s 20 tiny tortellinis in it, I understand that a person had to pick up every single one of them and fold them. Pasta is a way of connecting with people, whether I’m the one who’s eating or I’m the one who’s serving it, and I really love that. NA: That emerged as a theme to me while watching: simple cooking as an antidote to overwrought technique cooking. It seems that simple methods, or home methods, are often the most pleasurable in terms of both making and eating. SN: Often the techniques, you know the techniques that we practice in restaurant work, helps make it easier and more fluid and faster. But even Chez Panisse is very much rooted in the home cooking of France and the home cooking of Italy, and that’s why when I was learning to love food, I also learned to really respect the grandmothers and the home cooks. Even from the beginning, when I understood these four elements as a system, I remember so clearly understanding there was a problem because nobody translated it from professional kitchens for home cooks. It took me a long time, many years, to end up where I began and understand that I’m speaking to home cooks and that I’m an advocate for home cooks. When I started cooking, they told me “You won’t know anything until you’ve been cooking for 10 years,” because that’s when it lives in your body and it’s second nature. And that was before Malcolm Gladwell’s 10,000 Hours, but it’s true, 10 years is a lot of practice, right? But if you think about it by that sort of argument, who’s been cooking the longest? It’s grandmas. Who’s going to know it better in their bodies than anyone? It’s grandmas. So if I can devote the respect to them and help raise them up then I feel like I’m doing something good. NA: One of the most beautiful things about the show was how deeply you immersed yourself in every culture you visited and how you had no fear in doing that. SN: It’s interesting because there were a couple times when our director needed me to get a little piece of information in or make a certain point, and I’d be like, sorry, no way I can say that. I can’t go into someone’s house and tell them how to cook, how to present themselves. I didn’t come here to talk, I came here to listen. And so we would figure out how to get what we needed through questions. But it’s a complicated thing because I think in many ways that’s not what we’ve been shown on television: people going somewhere and being actually curious and just listening. NA: I think that factors into why the show has resonated with so many people. I don’t have Netflix numbers because Netflix doesn’t give its numbers, but the show was all over my Instagram timeline around its debut, and that says something. SN: I just sort of gage it by the fact that everyone and their mother has watched it. NA: Did you have a strong hand in styling episodes—how you wanted the camerawork to feel, how you wanted the look to be? SN: I would say our director Caroline Suh helped me shape what this show looks like. And our director of photography, Luke McCoubrey, was extraordinary. He has an otherworldly sense when it comes to light and lenses and the camerawork was just extraordinary. Caroline and I spent a lot of time talking and she spent a lot of time really familiarizing herself with my life, and my home, and my quirks. She asked me to make her a list of everything that I love and I made this 12-page document of everything, including things that inspire me. She and Luke sat down and they really used that to create the look and to create the feel of the show. In terms of the food photography, they were pulling a lot of stock photos and I was like no, no, no, no, I don’t want this food in my show. So then we reached out to all the food photographers I know and love and they provided really beautiful photos, unlike food photos that I’ve really ever seen on screen, like what you see in a glossy magazine. They did a great job. And the producers did a great job finding all of that amazing archival footage to make it fun and funny and quirky. It was meant to have a whimsical feeling because the whole idea is this shouldn’t be so serious. And while food deserves our respect and our attention and our time, I just don’t want it to seem too serious, too unapproachable. From the beginning I said no classical music, I don’t want any classical music in this show. We only did classical one time, kind of as a joke, when I’m making the pasta and slurp-test the noodle. NA: Yes, yes. That noodle. NA: The show has its own irreverence, its own narrative feel. It almost felt like chapters in a story, and my big question is are we going to get more? SN: Well, I do think there’s an argument that the show could go on indefinitely. I think we could wander in every country and learn something. But I’m tired. It took me many years to write the book and then I talked about it for two years straight. Then I made the show for two years and now I’ve been talking about the show for a year—so I’m tired and I need a break to sort of collect myself before I make any decisions about what’s next. But I’ve been so inspired and it’s been so incredible to see this thing land with people. I’ll say that the amount of women in the show, the way we tried as hard as we could to be very culturally sensitive as we traveled, the decisions we made about the way things looked and the way things read, all of those were very intentional and took hard work because the way the river’s flowing is kind of the opposite, right? And there were so many decisions that we made, so many things that I felt were important because I thought maybe this is my one shot—I may never get to do this again so I’m going to give everything I’ve got and do it right. I wasn’t sure that it would necessarily land with the viewers. I wasn’t sure that people would notice. I walked a very fine line between honoring food artisans who make exquisite handmade things that have 100- or 1,000-year-old histories and also trying to make very accessible food that anyone on any budget can make. That’s a hard tightrope to walk: to try to not alienate people and still elevate what could be perceived as snobby artisan stuff. But I’m moved by the fact that people noticed every bit of it. I honestly don’t read most of the press because it’s too overwhelming, but I know that people noticed these things and people have written to me about it. I got this great email from a woman who said it didn’t even click for her until the third episode how female-heavy the show is, that I did it in such a gentle way. The fact that so many people have responded from all different backgrounds and noticed is the most powerful part of it for me. And that’s something that I would like to continue doing. NA: It is a feminist show but not one trying to teach ideology. It just inherently is woman-forward. SN: Thank you for noticing. NA: For someone who is a novice cook or a home cook, and they’re curious about Iranian food but maybe intimidated by it for whatever reason, what would you recommend to make? 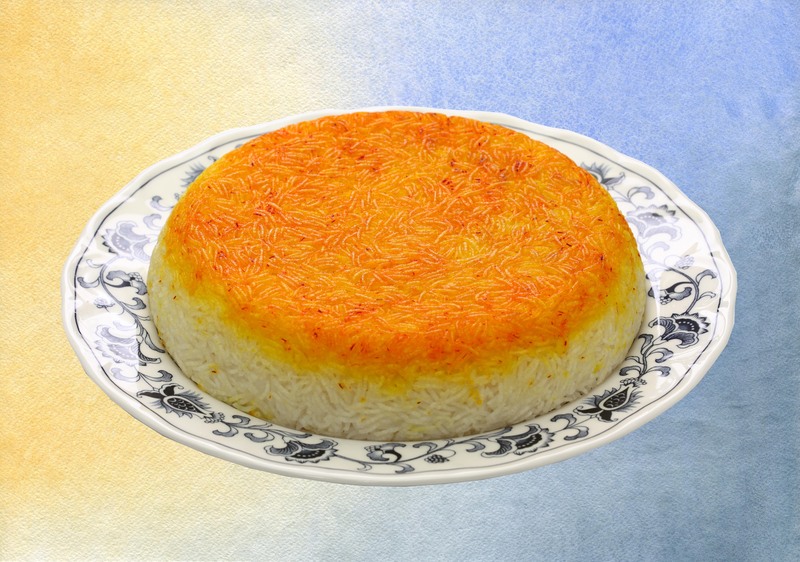 SN: I have a simplified recipe for tahdig, like a no-fail method. In my book it’s called Persian-ish Rice. It’s been tested so many times—so many different people all over the world have made it and it works and it’s easy. Much easier than the one we made on camera. People everywhere have sent me the pictures of their versions. Do you know how hard it is to make something that anyone can make? It’s crazy, it’s amazing, and it worked.